Antigua and Barbuda's national flag was adopted on February 27, 1967. 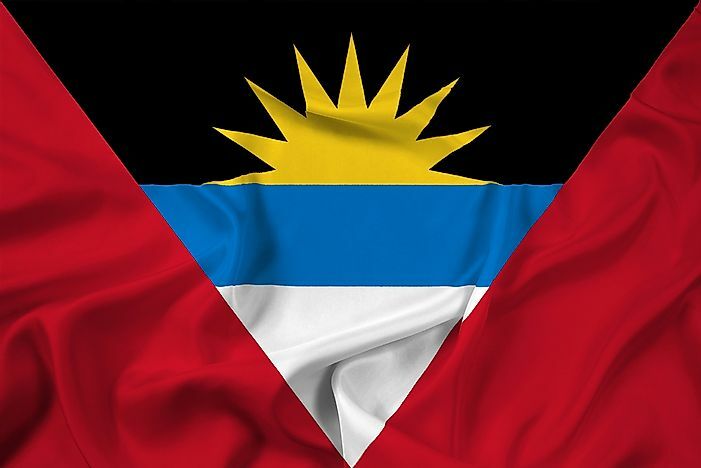 Antigua and Barbuda adopted its official flag on February 27, 1967, when its status changed from colony to associated state of the United Kingdom. The flag replaced a colonial flag that had been used in Antigua and Barbuda between 1962 and 1967. Full independence from the United Kingdom occurred in November 1981, but the new nation decided to retain the flag introduced as an associated state in 1967. A competition was organized in 1966 to develop a design befitting the country’s official flag. The competition included over 600 competitors, and renowned local artist Reginald Samuel emerged as the winner. Samuel received a prize of $500 and his design was adopted as the flag of Antigua and Barbuda. The winning design is said to have been chosen not only for its uniqueness but also because it was easily recognized. Interestingly, Samuel apparently created his design in only 30 minutes, and was almost late to submit his entry to the competition. The national flag is designed as a horizontal rectangle with the length-width ratio of 3:2. The flag's background is segmented into three inverted triangles. Two of these triangles are red and are set from the hoist and fly side of the flag. The middle triangle has sides of equal length and is inverted, with its base on the top of the flag and is pointed towards the flag’s bottom. This triangle features a tricolor of black, light-blue, and white, arranged horizontally, with the likeness of the rising sun incorporated on the black stripe. The light-blue stripe is half the width of the red and white stripes. The red field represents the tenacity and dynamic nature of the nation’s people in forging their destinies. The color also stands for the energy of the people. When combined, the yellow, blue, and white colors represent the sun, the Caribbean Sea, and the country's beaches. The rising sun is also said to represent the start of a new era, a belief that was most profound after the country gained independence. The light-blue band also represents the hopes and aspirations of the people. Even the V-shape made by the dissection of the isosceles triangle is symbolic and is said to represent victory. The black represents the African heritage of the people, as the majority of the population are of African descent. Black is also said to represent the fertile soils of the island nation. width to height ratio of 3:2. However, the naval ensign features a red cross which is set upon a white field. The national flag is set on the naval ensign’s top hoist side. The red cross of the naval ensign is based upon the Saint George Cross.